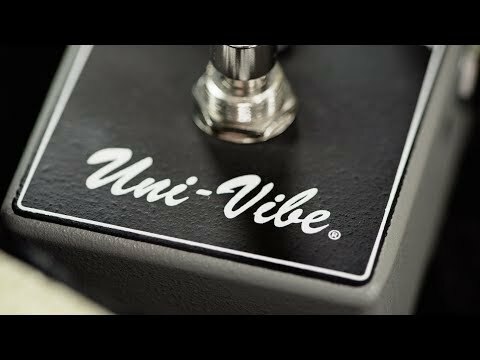 The Uni-Vibe Chorus/Vibrato is one of the most iconic effects in music history. Since the late ’60s, groundbreaking guitar players have us.. This MXR M68 is a modern re-issue that pays tribute to the classic leslie-like swirl of the original. With its simple three-knob interface, you can dial up the iconic effect to your taste in short order. First, use the VIBE switch to select either Chorus Mode—dry signal mixed with pitch-shifted signal—or Vibrato Mode—only pitch-shifted signal. Then, use the LEVEL control to set the effect volume, the SPEED control to set the sweep rate, and the DEPTH control to set overall intensity. As with all MXR stompboxes, the M68 is housed in a rugged metal chassis that can handle years of gigging as part of a compact pedalboard rig.